A New Life At The Aquarium! We worked fairly late on Friday to get the last of the shark wrapped up. We're not hard-coating, or painting this guy. The hard coat will be done by another shop, then he'll head out for his spanky new paint job! The head kinda had it's own thing going on. It needed to be as hollow as we could get it. 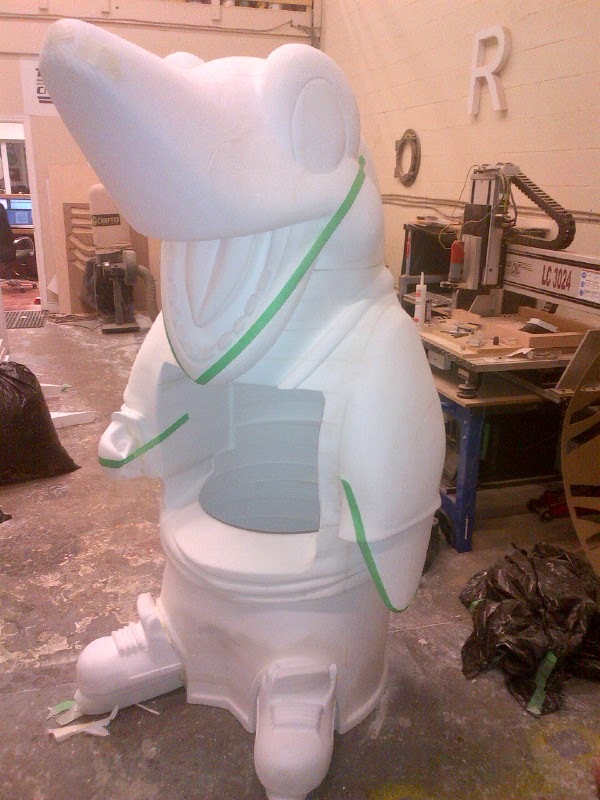 There will be a speaker placed into the roof of it's mouth so he can speak, and the back of the head will get a filling hatch cut to re-load the machine with stuffing. This was accomplished mostly in Aspire, by cutting out as much of the inside as possible, but the head file had to be sliced accordingly to allow for this. 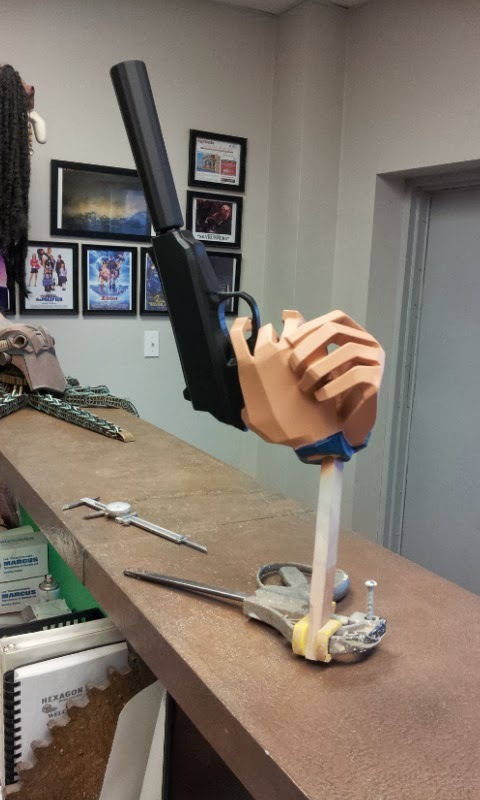 The head was assembled, and glued on as a final piece. The bottom jaw going on as the very last piece. I nested the teeth together in Hexagon, and added a network of .250" rods that served as tabs during the machining. I toolpathed this file in Cut 3d, as it almost completely automates the double sided machining process. I especially appreciate the over-cut feature! the last step was gluing the teeth into the mouth. When I sliced the teeth off the mouth in the computer, I left a little stub of the teeth in the gums. This made for quick locating all the teeth during gluing. The shark got installed today at Ripley's Aquarium, and the paint job looks great. With the hardcoat on, you could hit this with a baseball bat, and it wouldn't leave dent! A quick job that came out great! My kinda jobs! 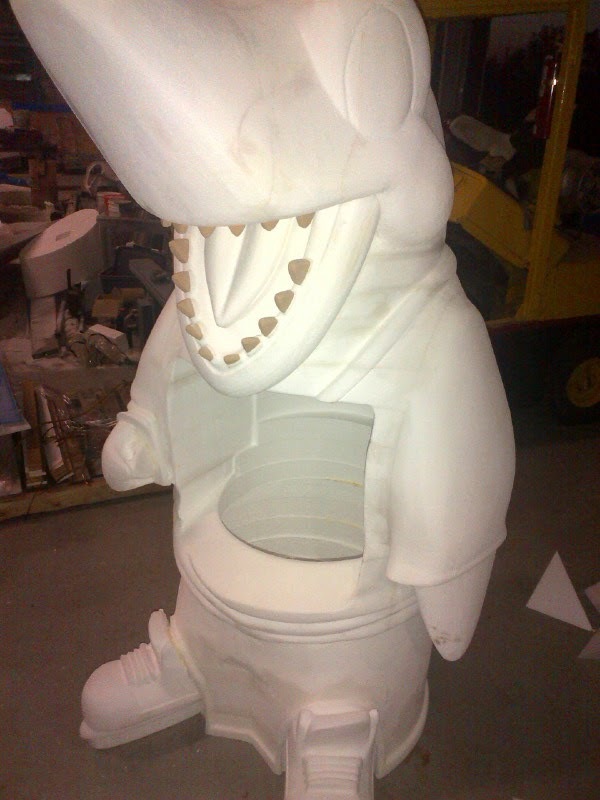 Styrofoam Sharks, and Shop Safety! Before I post about the Ripleys Hockey Shark build, I thought I would post a short video on Shop Safety. Normally I don't post random things from the internet, but this video is somewhat related to what we do, and the 'Pro Safety Tips' never go out of date. Before you watch the video, it is important to note that they asked a kid to teach his brother about shop safety, adults acted the story, and they overdubbed the kids voices back on. We had a last minute emergency Monday night! The art director for the Christmas Horror Story called Monday evening, around 10pm, asking if we could fabricate one more rigid crosier for Tuesday midday. So Jody and I headed back to the shop to cast and paint one up. We didn't get home again until 2 am, but at least we got to sleep in a little before delivering it to the City. I do believe it was shooting that evening! 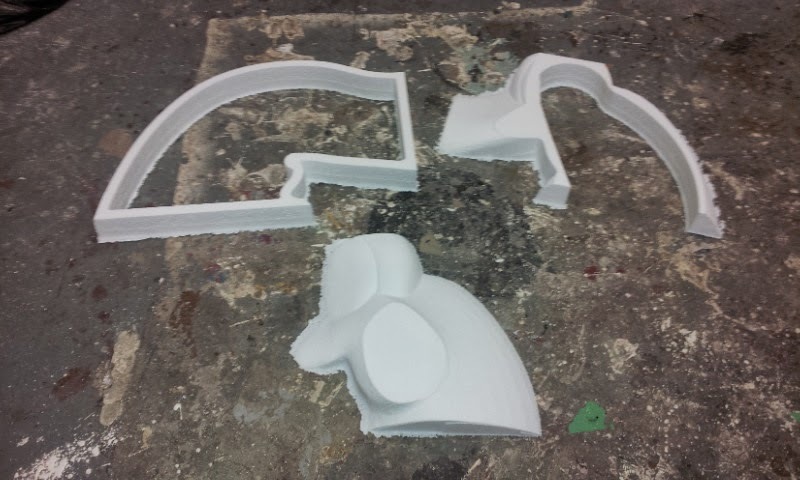 It really became a matter of waiting for our Techno cnc to finish the parts, then glue them up. This left me with the time between pieces, to clean up the seams as I went. Because this whole thing will get around 3/16" of urethane hardcoat, a-lot of the detail was simplified, like the laces on the skates. I purposefully left out the bow, that the laces would be tied into, for just this reason. On some of the layers I made the decision to just machine one side. 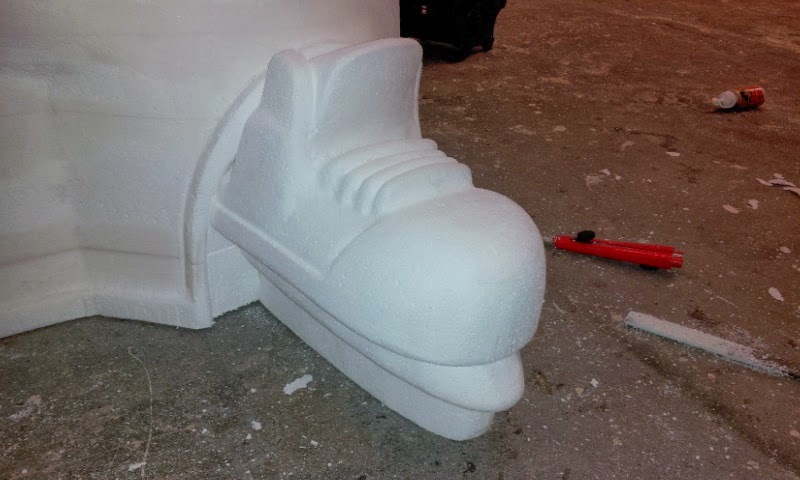 If the transition wasn't complicated, it was faster to quickly shape it with 80 grit sandpaper, than to flip the foam sheet on the cnc, and machine the back side. We should have it all cut and ready to send to hardcoat by end of day tomorrow! Providing there's no late night crosier developments in our future! And remember, always wear gloves when you do softly tips with the hammer! What do sharks do in the winter? They play hockey!!! Or at least the Canadian ones do! This is the second shark for Ripley's Aquariums that we're doing. This will dispense the stuffing that goes into the 'Build a bear' stuffed animals that you get to build yourself. 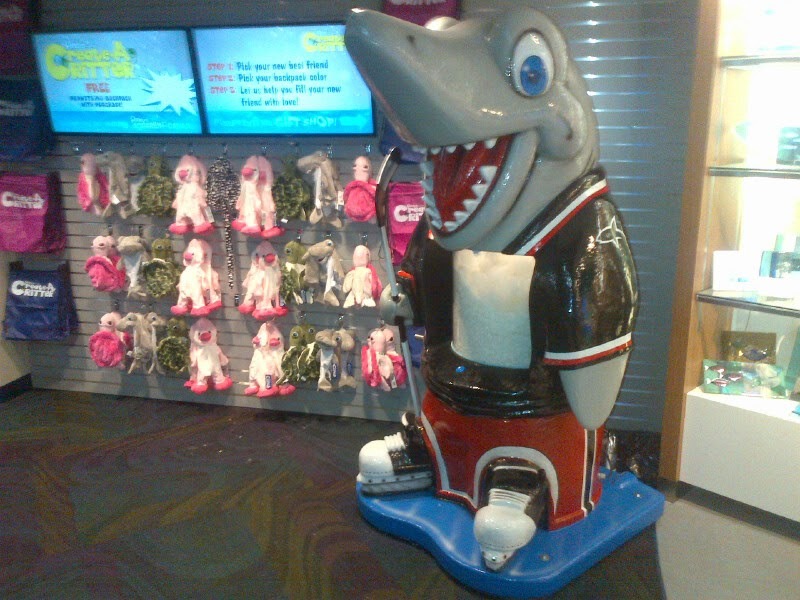 The good news for us is that I only have to bend the flipper, and add skates. The rest of the model was re-purposed from the first shark we did. 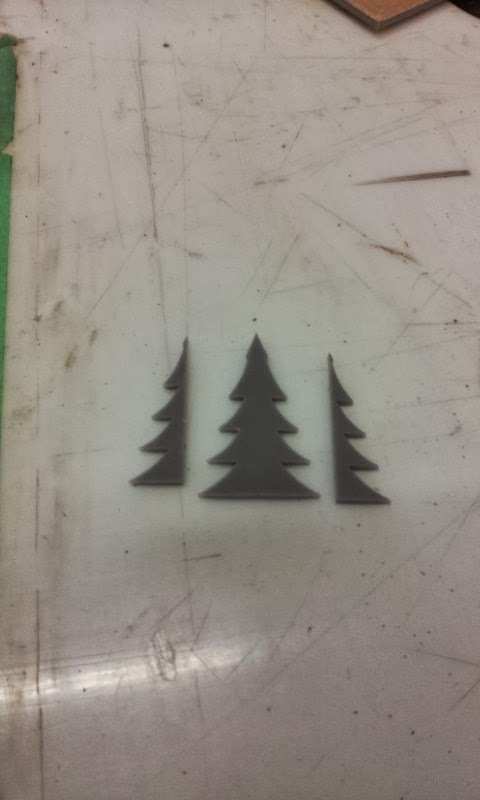 The cnc-ing went pretty fast. I toolpathed the whole thing with a 1/2" ballnose cutter, and was very careful to confine all of my strategies to just the parts that needed cutting. About half the files need double sided machining, so this is critical to save as much time as possible! We only got a few layers done today, but I think we're off to a great start! 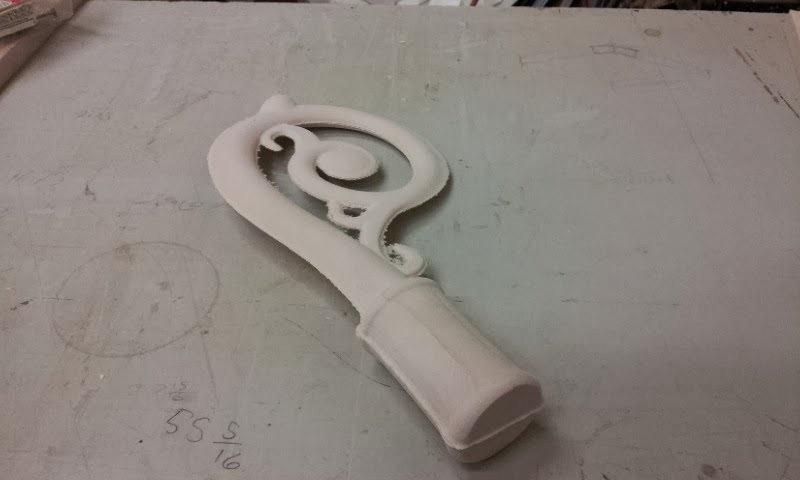 With the mold for the crosier finally finished, we cast up a couple of them in rigid white plastic. 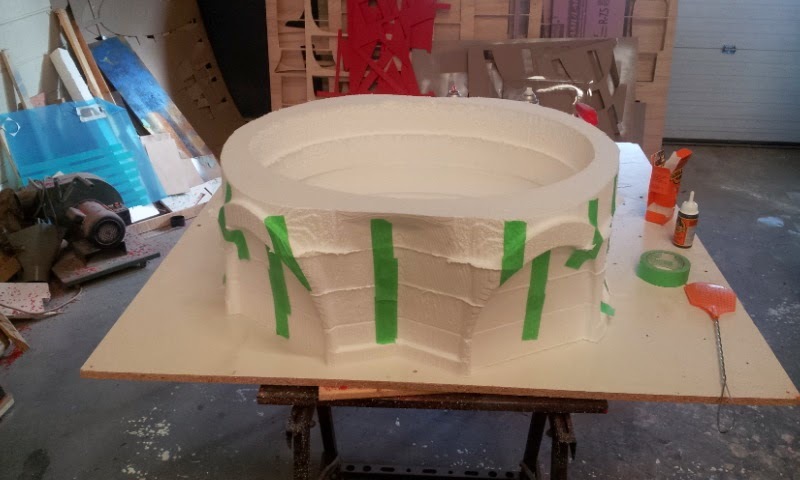 For added strength, we added a metal armature inside the mold. When the resin locks onto the metal, it should be almost indestructible! 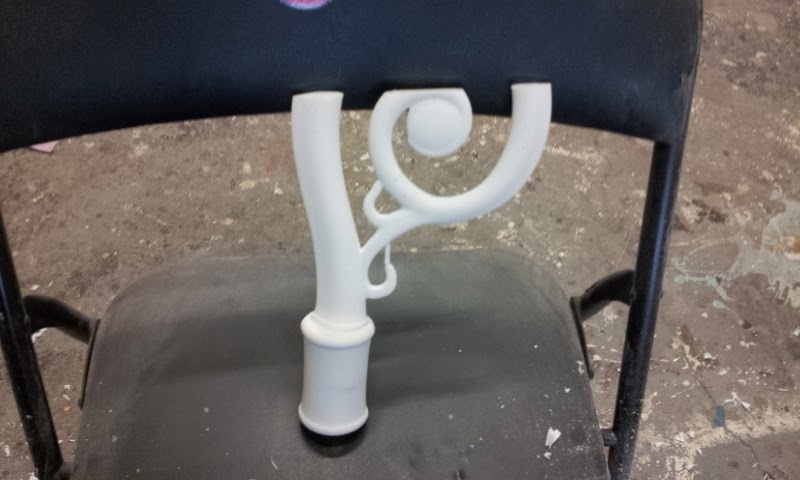 We also cast 2 additional crosiers from softer rubber. These will get the same finish, but will be softer in the combat sequences, in case of any accidental mishaps during the fight scenes. The second crosier was cut in half, as per their request. This is so FX can make it look like it's been buried into someones chest! Mmmmm...........Nice! 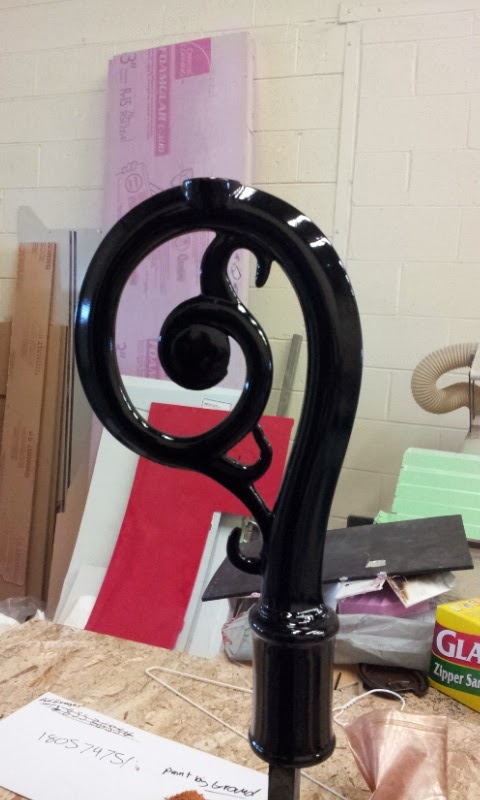 With the castings cleaned up, and primed, they all got a glossy coat of black paint. This is the first step in our buffed metallic finish! We let the finished pieces sit for awhile to dry before we packed them up and headed out to deliver them to the Art Director in Toronto! I might cast an extra one for myself to settle any traffic disputes that might arise on the way to the city. The DVP highway can really bring out the worst in commuters! Fedex picked up our 2 huge crates on Friday that are off to California. That left us to work on the crosier death weapon for the film A Christmas Horror Story. I never had any intention to 3d cnc the Christmas Tree spike of pain at the top of the crosier. This was laser cut from 3/16" acrylic. This will get glued up and a 2 part mold cast. We'll cast this, and add it on after. 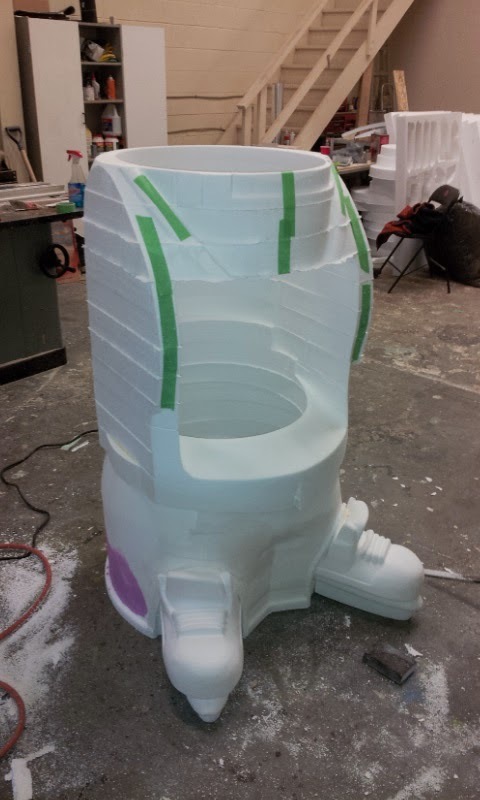 I added rubber feet, suspended into the silicone rubber, to act as locator keys for the two mold halves. This should allow the two mold halves to lock together, insuring proper alignment. 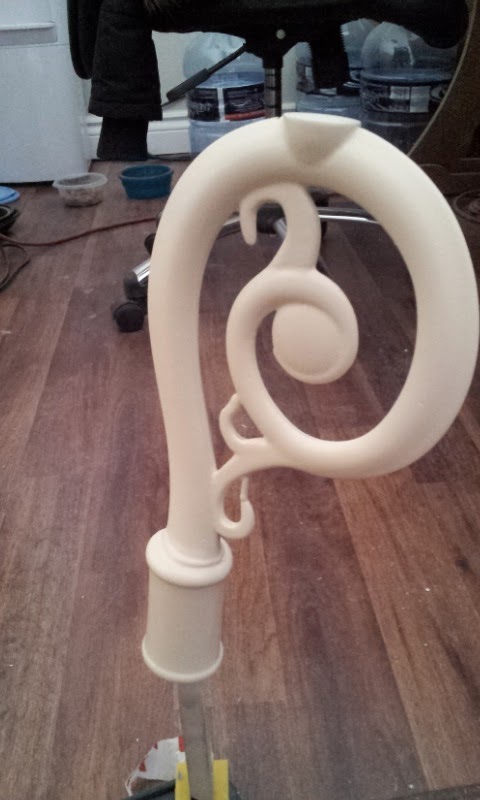 The crosier got multiple coats of primer, and sanded smooth. 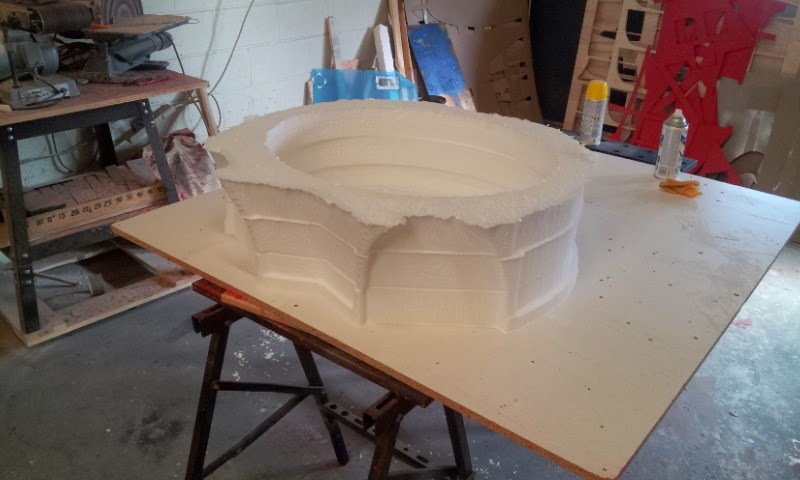 We made a simple mold box, and will only fill it half way. Once the first half cures, we'll pour the rest of it. This should give us our 2 part mold we need to cast this. I also added suspended rubber feet on this part as well. Again, allowing us to key together the 2 halves. I'll cut in a pour spout at the top after the rubber hardens, and the part removed. 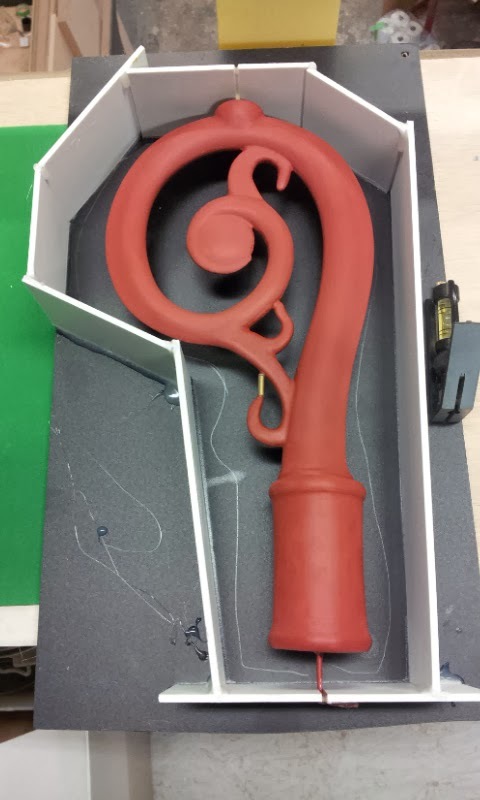 It's hard to see in the image, but I glued a small section of 1/8" brass rod to connect the very bottom piece of scrollwork to the rest of the model. This should prevent any trapped air, which would result in a void in the casting. 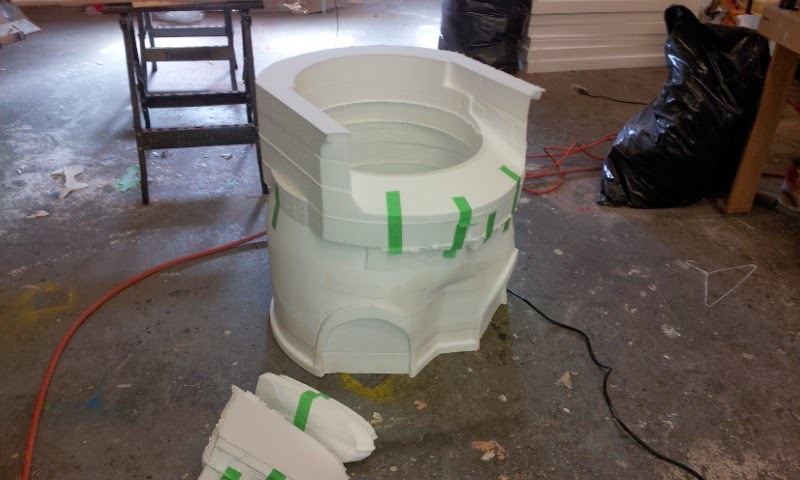 This will get cut off, and cleaned up on the final castings! 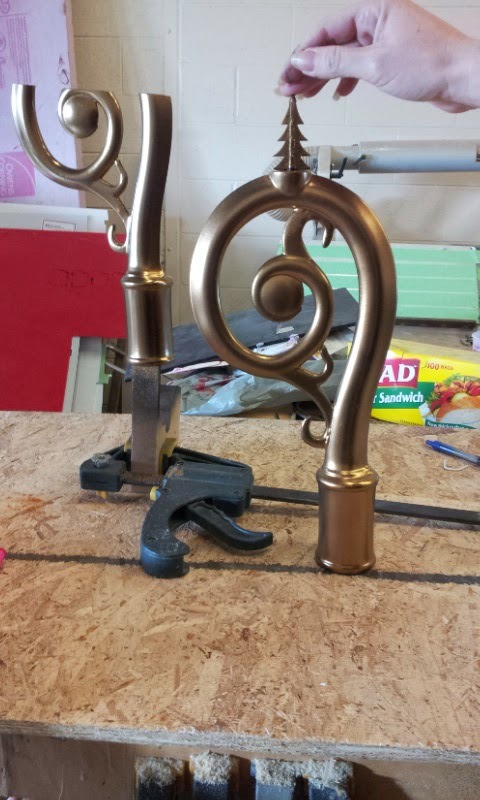 We've pushed back the work on the crosier for a little bit right now. Our other 2 jobs both have a deadline of Friday, so were head long into that right now! "Weird things on my desk!" But say it again and imagine some sort of echo! Santa's Bringing a Little Death This Year! While were working away on our various NDA jobs, we also started a new job for a film. I do believe the title is "A Christmas Horror Story"
One of the items they need is Santa's crosier. This however will be a gold crosier of death. I modeled this up in Hex for the art directors approval, based on a couple of quick sketches they supplied me. Notice the Christmas tree spike at the top? That's what I'm talkin' about! I imported the model into Aspire for machining. I set the model in the center of the working plane, as I plan on machining this side, and a mirror copy for the back. I decided not to double side machine this as one part, as I wasn't quite sure which direction we would be going when it comes to casting them. Were casting them, as they need a hard version, and a softer rubber-ish one. I'm also going to cast the tree at the top of it separately, which is why it's not included in the Aspire model. We're cutting this from 3/4" 30lb HDU. I didn't run a roughing pass, even though I was cutting with a 1/16" tapered ball nose cutter, with a 5% stepover. Total time per side was only 22 minutes. The final pieces fit perfectly, as usual! 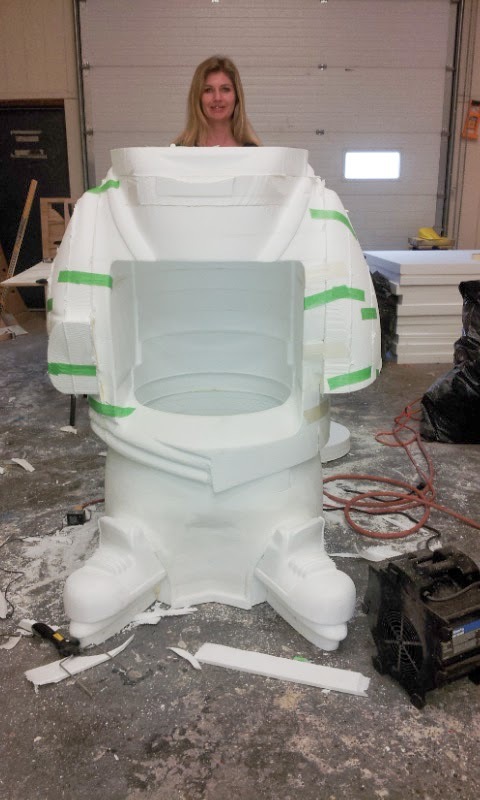 Tomorrow I'll get it primed and sealed, ready for ripping a mold!